I drove up the bumpy unpaved road, following the directions given to me by phone. My daughter was with me, excited to meet an artist, she prepared some pictures to present her. My phone rang with my new ringtone "I'm so shiny" from 'Moana' (delighting my daughter), "Are you lost?" was the question. "No, I think I'm almost there", we bumped along. I was contacted by Jan's daughter (thanks Dawn! ), who lives in Palma, a few months ago and we decided that no series about creativity in Antigua would be complete without meeting the renowned Jan Farara who made Antigua her home in 1970 when she first arrived by sailboat, and has never looked back. Her art now proudly graces the walls in restaurants, hotels and homes all over the island. A balmy breeze drifted through Jan's studio and home in Buckleys as I was welcomed in by Teddy the dog and Shadow the cat, both rescue animals and much-loved by 72 year old Jan. With her delicate necklace inscribed 'Love' in italic silver, her iridescent blue eyes that follow me and her charismatic chatter, I am instantly smitten. 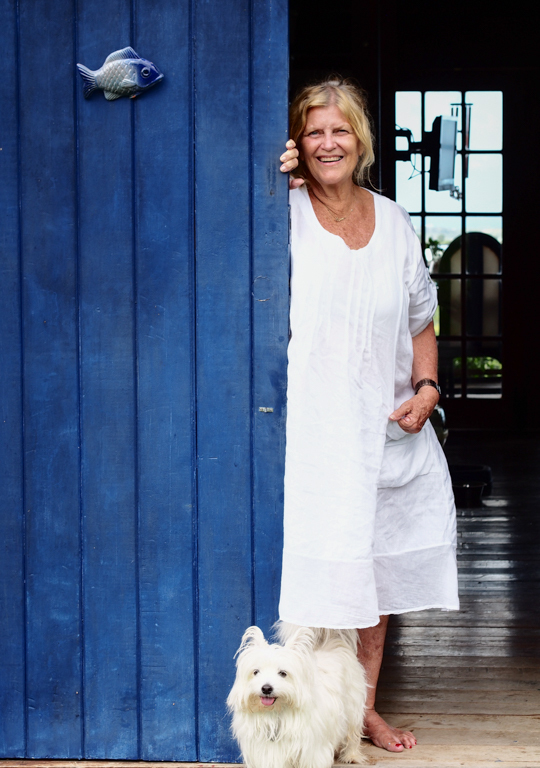 In Jan Farara's studio, Buckleys, Antigua. "It's a mess" she said. "Oh, but I love the colours!" I replied as I snapped away, loving the whole atmosphere. Unlike most of the other creatives featured here on Antigua Views, Jan's work is mostly prepared on a commission basis, so she doesn't feature in the galleries in Antigua. Instead she has been highly sought after for her versatility as an artist and her ability to produce large scale pieces and murals. She openly took me upstairs to see some work in progress in her loft studio and to appreciate the expansive island views that she wakes up to each day, as she spoke seamlessly about her passion for art, her recent shopping spree and tales of her bygone years in a restaurant career. I asked her what she paints. "I paint anything" she replies. Give her a colour theme and she will provide the magic, or as one client did - just give her the size you want and allow her to create. But always only one painting at a time, so that it can evolve from start to finish and then she can move on to the next. To contact Jan Farara, click here for details. I you would like to discuss a commission, please click here. 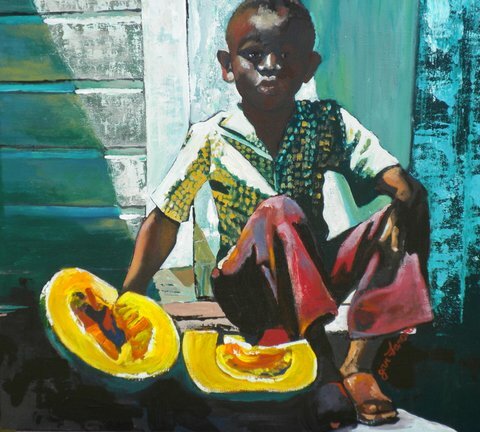 Her work is also on display in Dale Art Gallery in the new and fabulous Christophe Harbour, St. Kitts - find out more here. You are not originally from Antigua, but have made this beautiful island your home and in turn brought such beauty through your art - could you tell us about the journey that brought you from your childhood in England to life in Antigua? I went to the South of France at the request of a girlfriend who was bored and I decided to stay. I worked as a cook on a 50 foot charter boat with no knowledge of cooking or sailing at all. I bought a big, fat, very serious cookbook and with that and the fun help of charter guests (especially Italians), and some real boat chefs, I found an affinity with food. Even though art was my first love, anything to do with food became my second. I then married my skipper and set sail for the Caribbean. We arrived in Barbados on Christmas day 1970 and with my toes in the sand, a rum punch in my hand, the sounds of steel band music - I was in love with the islands. Then we sailed across to Antigua. We worked for 5 years in the charter business, from the Virgins down to Grenada. In 1975, I jumped ship and met my second husband who I married in 1980. My daughter was born a year later. I was a busy step mum with 3 boys too beside my daughter. We decided to get into the restaurant business in 1982 and ran Runaway Beach for 7 years, then renovated an existing building, on Long Street in St John's, into The Lemon Tree - an innovative restaurant and night club. After my husband's death, I managed restaurants and painted: mostly murals such as at Coconut Grove and huge historical ones at Royal Antiguan Deep Bay. Also at Jolly Beach where they kept building me more walls! One year I received a commission to paint a whole village street for the carnival stage. As I was working at Royal Antiguan as a restaurant manager from 4 pm everyday, I enlisted the help of another artist friend Marie Kinsella who I would leave painting while I went to work. 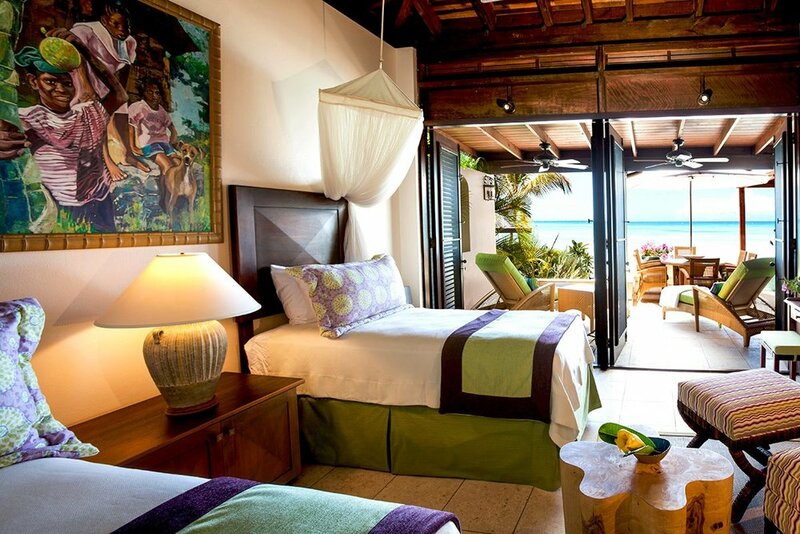 My true mentor was the interior designer Kathy Bowling at Jumby Bay. I knew her and her husband from my Lemon Tree days and she started buying my paintings as fast as I could paint them. Then came her story boards, mostly colours. We would look at the space, decide how big...how many. I would meet the home owners and find out which pieces of my work they like and from there I paint. This is why my work is so varied, as if I'm painting 10 paintings for one house they all have to be totally different. I've been doing this for 12 years now. My studio is in our bedroom / loft (glad I have an understanding husband LOL). I love this as I can prepare dinner, catch an old 'Law and Order' episode, take the dog for a walk, make my husband lunch and paint. I find as I get older and more experienced a lot of time is spent between layers of paint: thinking, looking and deciding my next move. I can't work on more than one piece at a time. I'm involved totally in a painting till it's finished before I can start the next. Did art play a big part in your childhood? Do you think of it as an important element to be encouraged in children? I wanted to be an artist since I was 5 years old and I used to draw anyone who would sit still long enough. My primary school only had 70 children altogether and my teacher and headmistress was an artist who took an interest in me. My secondary education was a school in London that streamed the arts from 14 so we were allowed to drop some science subjects, thank goodness, and take almost half our lessons in commercial and fine art. I passed my A level in art at 16. Most definitely children should be encouraged in all art forms from an early age. Music, writing, dancing and the history of it all. You studied commercial and fine art in London. What was your first job after college and how did you get it? My first job was for a big shoe firm in UK! I answered a newspaper ad I think. It was the advertising department at the head office. In the 1960's jobs for women were still hard and I remember drawing lines, making tea etc. I tried to help some window dressers one day to see how the ideas worked in the field. Not a good idea as I was very clumsy and windows are tight places! When did you sell your first piece of art, what was it and how did it make you feel? I can't really remember. I used my talent mostly to help promote for whatever boss I worked for. I worked for a dance studio and made a poster for the window, I think that was the first thing I sold. I felt quite proud I think. What mediums and techniques do you now use in your work? Acrylic on canvas. I used to paint in watercolour but it doesn't stand up to heat and moisture very well. I had a large acrylic painting act as a sail and take off a dock into the sea - rescued, re-stretched, good as new. You have a true signature look to your art that is envied amongst other artists and although you have been painting all your life, it became your full time profession in 2005. How has your work evolved over time? What themes do you enjoy to explore in your painting? How do you find inspiration and where do you go to find it? Everyday I see so many pieces of Antiguan life. People, flowers, trees and mostly the sea. I take loads of pictures and most mornings I scroll through my iPad looking for ideas. I think the way my art has grown over the years, is that 30 years ago I had to paint a definite view of something. Now I just take an idea and then make it something else. I want a feeling and I love the impressionists. I want to try different textures and I rarely use brushes - just for people really. The most important thing for me is the light, I want sunshine in my work and my life. When I paint an abstract I still want you to know what it represents. It's difficult to explain, but I need to keep the base real whatever I do with my interpretation of it. My work is bright and happy and I hope a reflection of me. I've never had a tortured soul or reservations about life, just bring-it-on and I'll deal with it. I learn something new everyday and hope to continue to do so. Many people have asked why I didn't paint full time earlier in my life, as I started this at 60. I wasn't ready for the solitude of painting before, I liked to be on the stage, running restaurants, singing with the band and generally in the middle of things. Now I love to be alone with my clean white canvas deciding where to start, my favourite thing is watching it come alive. If you could go back in time, what advice would you give to your 21 year old self? I don't have any advice for my 21 year old self. I've loved my life though it's been hardat times financially. I love sailing, it's the best freedom in the world. I've loved running restaurants and the best satisfaction is a happy customer. I tell students who ask my advice - "Never give up your talent. If you believe, you will get back to it, whatever life throws your way". When you are not painting what do you like to do, what hobbies do you have? You have made Antigua your home. Where are your favourite places to hang out here? My favourite place to relax is Cecelia's in her gazebo, with a glass of wine listening to the waves and watching the kite surfers. I always seem to meet a new client, or an old one, or make a new friend. I love English Harbour and old and young yachtie friends. What is your favourite viewpoint in Antigua? From my studio and home! (Editors note - it is Spectacular, one of the most far reaching views of the island that I have seen).